Work in progress on the reading hub. 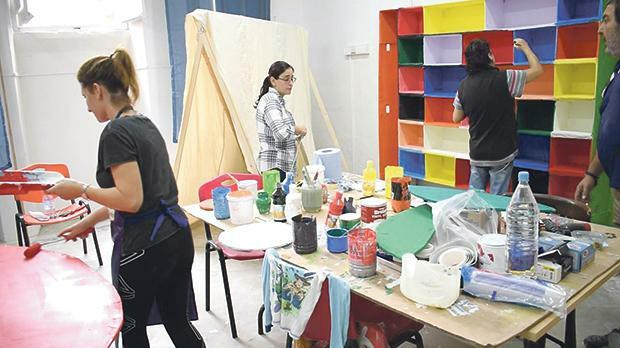 Mosta Primary A school recently embarked on a project to design a space within its premises into a ‘detoxifying reading hub’ where pupils would feel safe, welcome and encouraged to read. The aim was to make reading fun by integrating spaces and activities that involve sensory stimulation and encouraging learners to engage, explore, connect and learn. At the same time the project sought to adhere to the principles of education for sustainable development by reusing tons of strong cardboard and other waste, including some hazardous waste, which could have otherwise been thrown away. The author (left) with school head Dr A. Pulis. During the summer months new interactive whiteboards had been installed, leaving the school with around 35 large strong cardboard boxes – weighing 210 kilograms – to dispose of. But instead of disposing this high-grade packaging material, the thick cardboard was reused to create a sensory wall and book cases. The project served as an outreach to the whole school community, involving parents, educators and young students, and during the European Week for Waste Reduction last November parents and educators were invited to bring over cans of leftover paint to be used to decorate the cardboard furniture and walls. They also brought in bits of leftover cloths, buttons, zips, wool and other textured materials that were recycled to set up the sensory wall and to furnish the room with cushions made from used material. The design of the detoxifying reading hub involved consultations with professionals such as occupational therapists and inclusion coordinators working with children who would especially benefit from such a sensory input. Sensory stimulation not only benefits particular students who may face self-regulation challenges, but enhances the reading and learning experience for all. By integrating sensory stimulation in the design of this reading space, the school sought to meet the needs of all students. 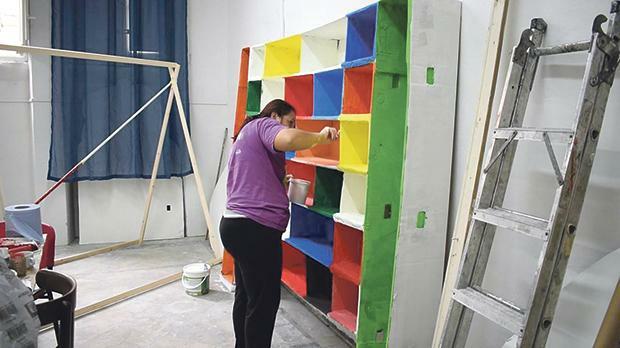 The project was the fruit of all stakeholders in the project: educators and students helped with the artistic creation of the murals and decorations, parent volunteers and neighbours from the community worked on the recycled furniture and soft furnishings, and professionals from the Occupational Therapy department worked on the sensory wall. The school handymen also gave a helping hand in the realisation of the project. The school believes that the project will: foster a culture of reading in the school; improve student outcomes and raise achievement; improve the general well-being of the pupils; create independent readers and readers for life and give all learners more opportunities for learning. 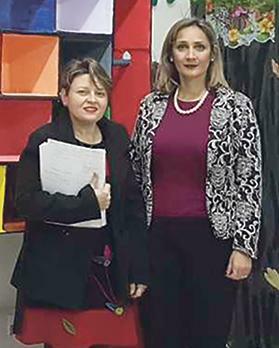 Bernadette Mercieca is assistant head at Mosta Primary A school.